New Testament - Today in Matthew chapter 17 verse 20 stood out to me: ""You didn't have enough faith," Jesus told them. 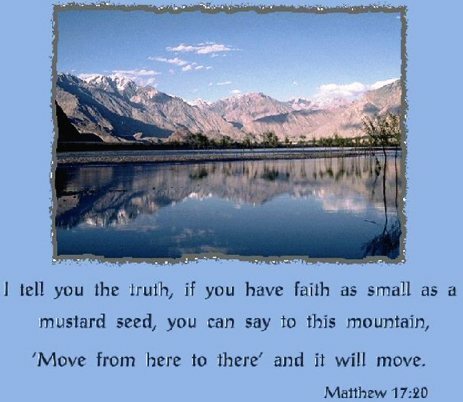 "I assure you, even if you had faith as small as a mustard seed you could say to this mountain, `Move from here to there,' and it would move. Nothing would be impossible."" As I think about this verse, I wonder about my own faith. How much faith do I really have? Do I have enough faith in Jesus? And in all of God's promises? Or - am I hedging my bets? Do I also place a lot of faith in my own power? My own skills? My own "smarts"? Do I truly have complete faith in Jesus and Jesus alone? If so, and if it was Jesus' will, do I believe that I could move mountains? Could you? I don't think that this idea of not having enough faith means that I need to "try harder" in any way. I think it means I simply need to depend more - rest more - relax more - give more - to Jesus. Trust in Jesus. Trust that his grace is enough... As a great Jeremy Camp song goes - "All of you is more than Enough, for all of me." Is Jesus more than enough for you? And Psalms verse 18: "They divide my clothes among themselves and throw dice for my garments." 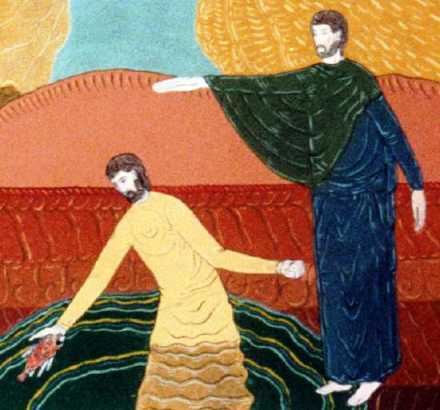 Compare to John 19:23-24 - "When the soldiers crucified Jesus, they took his clothes, dividing them into four shares, one for each of them, with the undergarment remaining. This garment was seamless, woven in one piece from top to bottom. “Let's not tear it,” they said to one another. “Let's decide by lot who will get it.”"
Even though at times God may feel far away He never is. 10From the day I was born, I have been in your care, and from the time of my birth, you have been my God. I wondered whether this could also apply to when we commit ourselves to God. I know that since my baptism on the 17th of May 1998 a day before my 28th birthday that He has been my Lord. As I was reading the Psalm again it suddenly struck me that its talking about Jesus and what happened to Him on the cross. I was very surprised that I hadn’t picked up on that on my 1st reading. 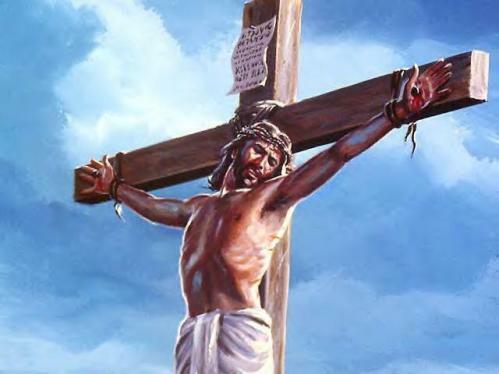 I meditate upon Jesus' passion and death a lot. Especially since seeing the movie. That really effected me. 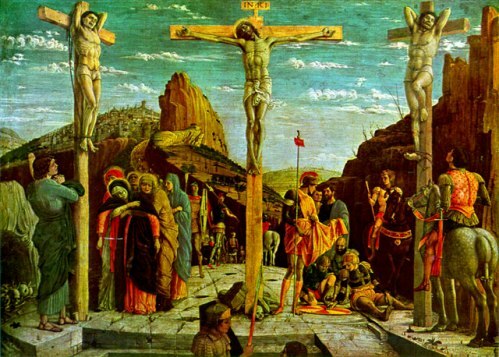 Yes we should meditate upon Jesus' passion and death more often than once a year. It was the most important to ever happen. We need to remember just what Jesus did. I also think about as I have communion each Sunday. I guess we see love at it's greatest...Jesus dying for our sins.I cried when I saw the movie...there are a lot of people who critise the way it was done but I believe the sufferings of Christ were real...if He could feel hunger,thirst,then He felt every lash of the whip,He felt the pain of being nailed to that cross....and Jesus didn't deserve to die like that,He had no sin. Today,many people look at God as a indifferent to what goes on in the world,we question His love for us when we are sick,bereaved,when we see children go through war and poverty.And we try to understand why a loving God would allow it to happen. the more we meditate on the death and passion of Christ, the more repentant we become; the more sensitive and pliable we are for our Potter. The story of Moses is just so wonderful to read ... I can keep reading it on and on! I loved 2:23, the last part "... and their cry rose up to God". What a beautiful thought; when we need God, when we talk to him, when we cry, when we worship Him ... it will all rise up to Him. We know that of course, but to read it like that, gave me the chills. Good chills!! Chapter 3, with the burning bush was just amazing!!! I read verse 6 "When Moses heard this, he covered his face because he was afraid to look at God". He covered his face? Why did he cover his face? Did he think he was not worth it to look at God? Or was he ashamed, cause of his sin? 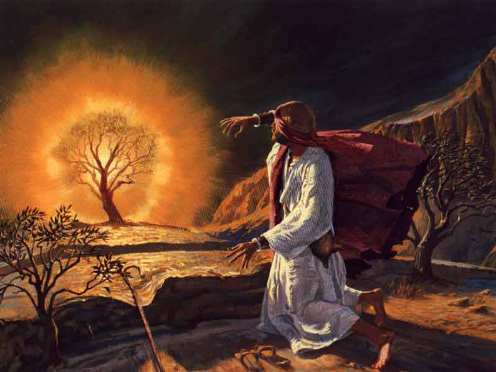 What a wonderful way to have a converstation with God ... at a burning bush ... The Dutch Bible talks about a blackberry-bush. I think about it a lot how and why Jesus died. I never meditated upon it ... not because I don't want to. But because I don't know how to. I know how to meditate, but I never meditate upon the Lord. For very personal reasons. It sounds weird. I know I will meditate upon the Lord in the future, but it's too early for me now. What stood out to me in today's readings in Exodus is how God chose Moses to lead his people out of Egypt. Moses! The murderer! This showed me that you do not have to be perfect in order to be used by God. He accepts us just the way that we are. Thank you Lord! I also liked Moses' obedience. God told him what to do and he listened. I think if that were me today I would have been like, "look God those people are not going to listen to me who am I? Sorry, you may want to find someone else stronger and smarter than me." LOL! Also, how God not only told Moses not to worry that He would be with him but He also said that He would make the Egyptians look favorably on Moses. He could have just said do as I say and that's that. What a great God you are! Prayer: For obedience. Give me the wisdom to know when God is speaking to me and give me the strength to be obedient all the time. Whether it is something that I want to do or think that I can do at the time or not. Praise: Thank you for you Word Lord and revealing yourself to me. You are awesome!! I remember studying the story of Moses in my Theology A-Levels at 17 and being amazed by it for the first time ever. It prompted me to write this song and todays reading reminded me of that so I dug it out. Thought I'd share it. It's called "Holy Fire"
Why me? What good could I have done? Fire getting higer and higher and higher. "Moses, Moses, Take off your shoe"
"This land is far too Holy for you"
"Moses, Moses, I need you"
"Moses, Moses there's something you can do"
"Moses set my people free"
I cried "Why have you chosen me?" 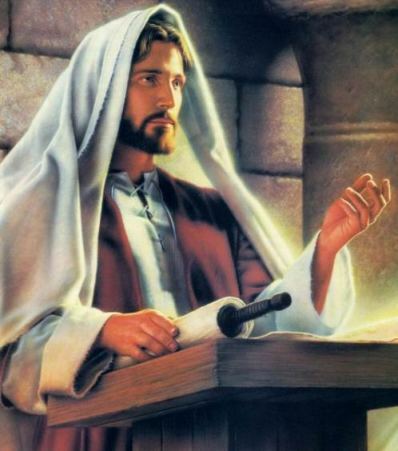 Said "I have land and people to give"
"You are the ones whome I choose"
"my love is something you'll never lose"
"Go for it Moses I'll stay by your side"
"I've choen Israel for my bride"
"Lead her to the promised Land"
"Go on Moses, take my hand"
Give me your name by whom am I sent? He said "I am who I am and no other gent"
"Do not enslave my people here"
We reached the sea, cried "What can we do"
Fire getting higher and higher and higher. 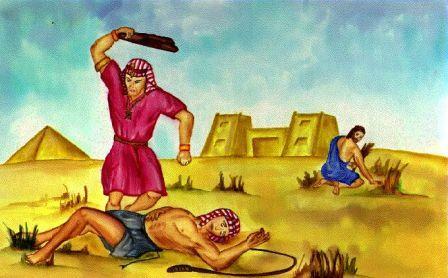 A point to make in Moses killing the Egyptian...he looked right and left. BUT, He didnt look up! We cannot get away with wrongdoing, if we do somthing cause we think no one is watching, we are wrong, the Lord is watching! I like Ex 2:24-25 "God heard their groaning and he remembered his covenant with Abraham, with Isaac and with Jacob. 25 So God looked on the Israelites and was concerned about them." God hears our groaning. Even wen we dont pray outright to God, the spirit intercedes for us and speaks through groanings n supplications to God. thats amazing to me! I love how it says, God was concerned for them. In this same way, He loves us and is concerned with all we go through! its amazing the God of the universe is concerned with me! Another thing, Moses was concerned because He wasnt sure how God could use Him, he had a speech immediment, possibly a stutter. God will use who He wills and will equip them. My own dad has dyslexia n was called a dummy back in school n had to drop out of high school. to this day he has "i'm a dummy' mentality and is often wondering why he cant read and write well, but my dad is a man of God and he has been used by God is such an awesome way..my dad is sooo blessed. He's a tecaher at his church, gives sermons sometimes, has done mission work, does church counseling, did prison ministories and sooo much...every day he is working on something of the Lord. God gave him talent as an artist and he is skilled with his hands in making things. I see a man who is sooooo blessed and used by God, not a dummy, but a man of wisdom and perserverance. God equips those He calls. We may feel we have limitations, but often those limitations are HUGE blessings and inspirations to others! satan may tell us we are no good or useless, but God is not limited by anything! I definately think about what Christ did for me every day. I mean, I'm soooo grateful. when we really study it at church and get into His suffering, it really hurts b'cos I love the Lord so much, my sweet Jesus, and hurts all the more that He did that for ME! and all of us. We are currently in the book of John at church sunday nights, we are nearing the time of His crusifixion and it really does get me, i do lose it at church too. when I saw the Passion of the Christ, (yes, i was full on sobbing uncontrollably in the theater) but i was thinking, I couldnt go through that. Do I love anyone that much??? I dont think i honestly can give an affirmative. Would anyone besides Christ do that for me?? I highly doubt it, which makes His love more amazing. It defies human reasoning,...in fact many none of us will ever FULLY grasp His love for us until we see Him. BUT, knowing Christ is more then an emotional experince. I know many nonbelievers who saw the Passion and cried, but that was it. They didnt "get" that they had a choice to make after seeing what Jesus did for us. What are we doing with Jesus? We cant just cry and say what a good man, He died of the whole world! well, only those who receive the gift are benefactors and heirs. we cant go on living ungodly lives thinking, 'Jesus died for me, I'm safe. back to living for self' What are we doing about that? 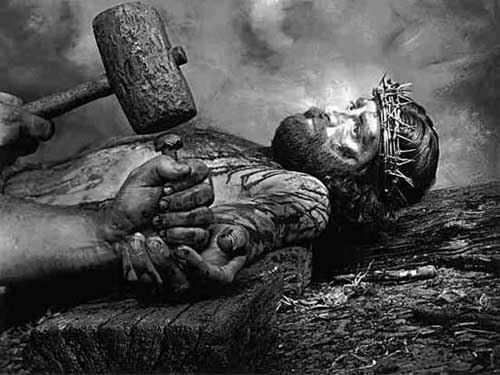 We are called to deny ourselves, pick up our cross and follow Him. I think we can all say discipline is not pleasant in any way. 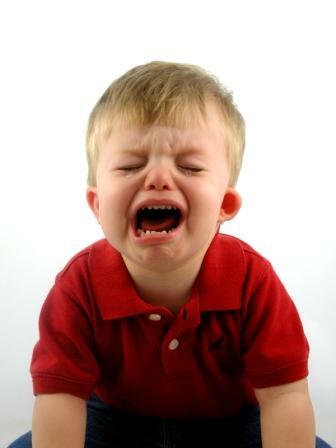 But i love it!! (afterwards!!) I need His correction. His discipline proves I'm His child. if i was getting away with wrong, thats something to be concerned with....but i'm His child, and as a parent loves his child he corrects him b'cos he knows wats best, he sees the outcome of wat would happen if the child continued to disboey. I need instruction, i need His guidance, His teaching, His leading, His correction. I want God's hand on me every step of the way!!!! when i swerve off the path, i need a good scolding, some pain...b'cos in this, He saves my life! I mediate on Jesus's death whenever I receive communion. However, not always. I've attended quite a bit of passion plays, and it does help to spell out passion for me, to SEE it, to realize what Jesus went through. This isn't fictional. It actually happened two thousand years ago! 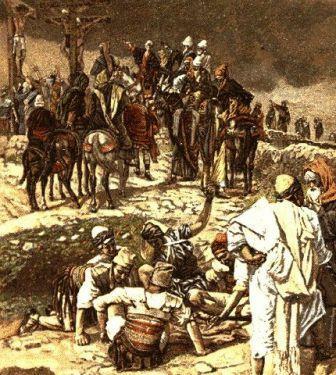 To mediate on Jesus' death...it is a must for every Christian to realize what their God went through for THEM, for US. Psalms 22, I never realized that Psalms spoke about piercing of hands and feet. My goodness, it stood out to me and got me choked up.